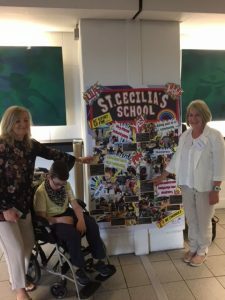 Kate Hoare and John O’Connor ran a table quiz for the school in Ballymote recently. 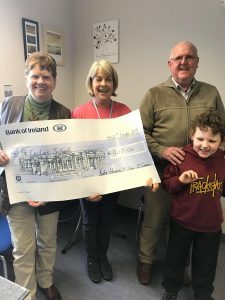 They presented us with a cheque for 1210 euro. 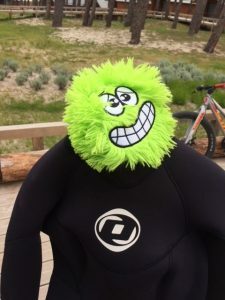 All proceeds are going towards the playgrounds. Thank you for thinking of us Kate and John. 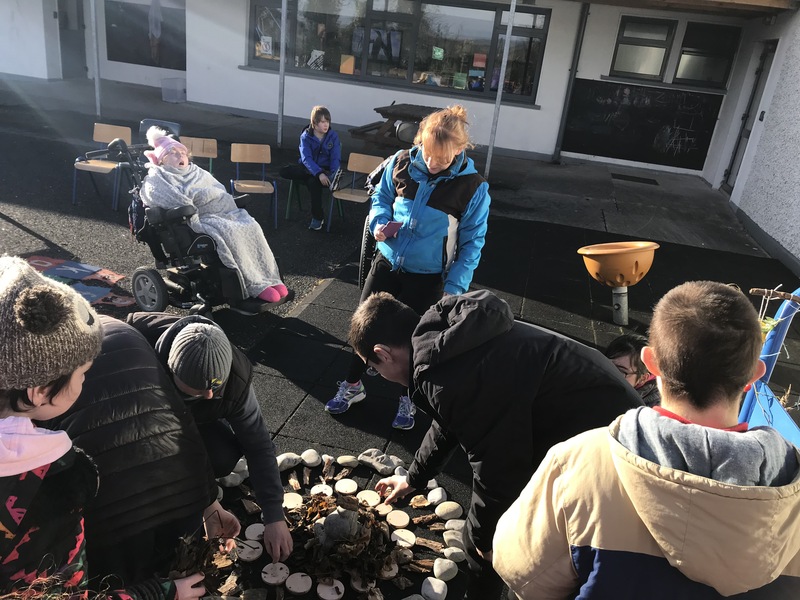 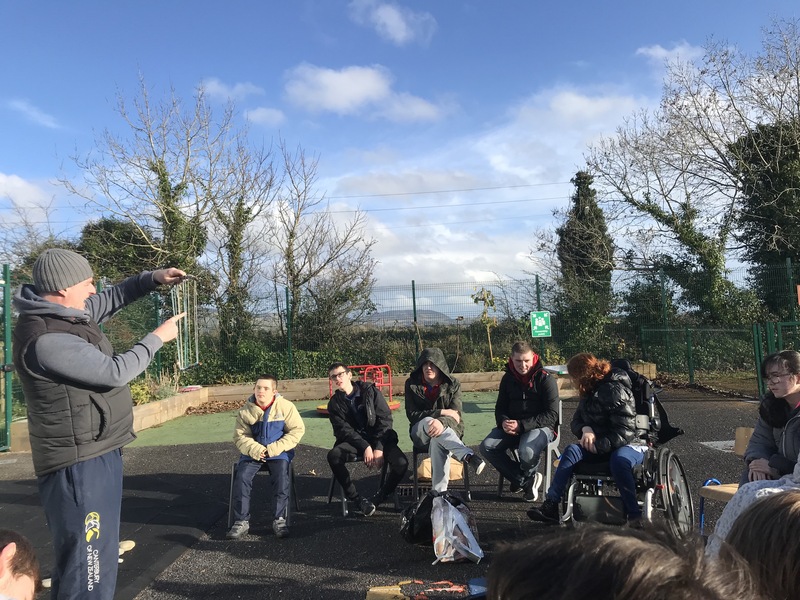 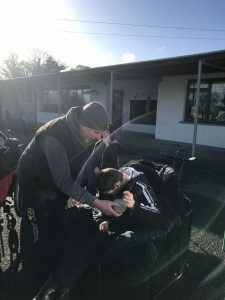 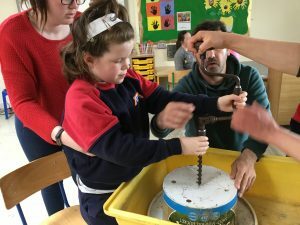 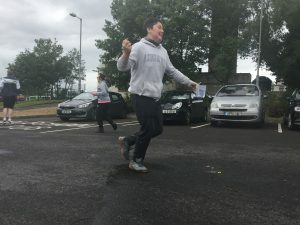 Today Shane in Green class organised a wonderful outdoor classroom session for some of the classes on the senior end of the school. 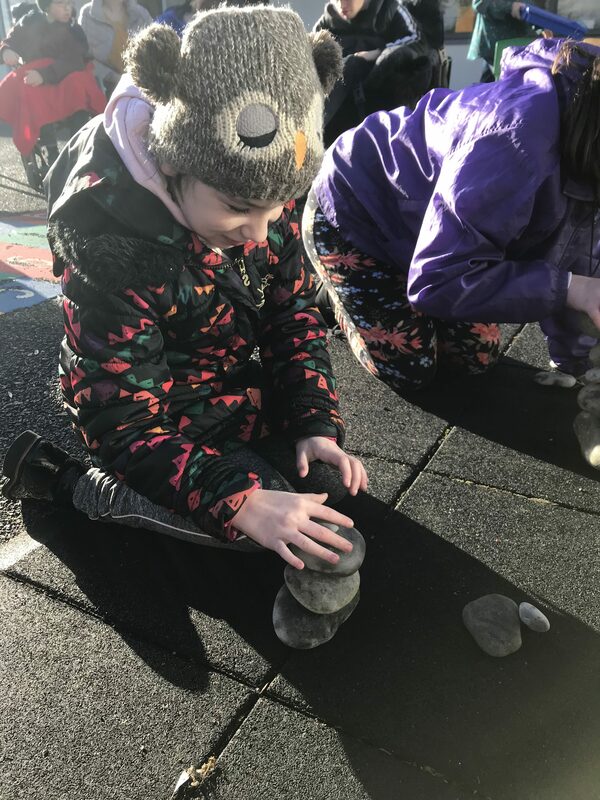 It was a bright crisp day and with coats on, it could not have been better weather to be outside. 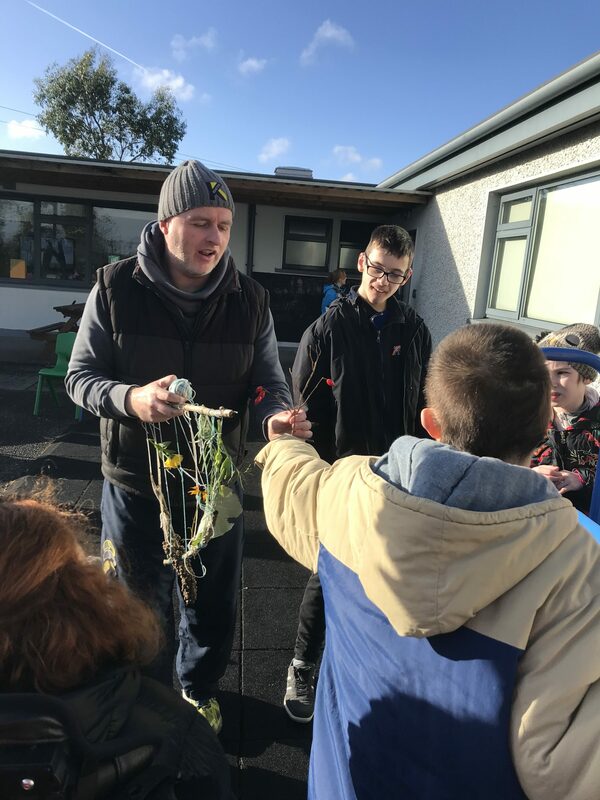 Shane had collected lots of natural materials from his locality, pebbles and stones from the beach, driftwood along the banks of the river, bark from the local woods and we also used what was available in our own playground- leaves, flowers and seedpods. 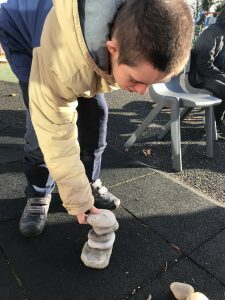 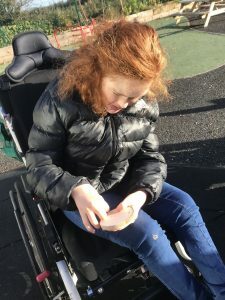 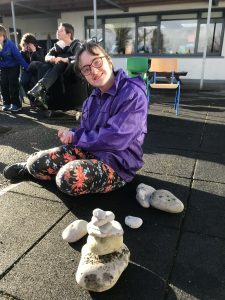 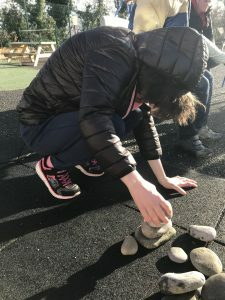 After handling the small light stones and the larger heavier ones some students built Cairns on the ground, as others built them on their knees while in their wheelchairs. 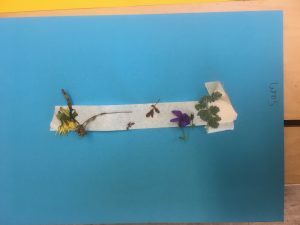 All students then went exploring to find some natural materials for a wild mobile. 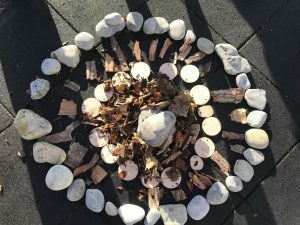 Finally we made a mandala using the stones, cut timber, bark and gathered leaves. 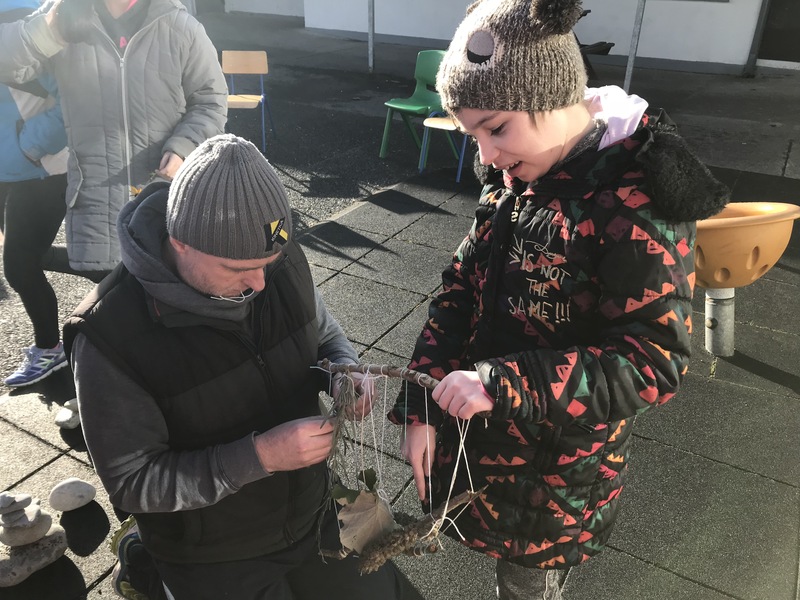 A really super afternoon of creative learning in our outside classroom, with much thanks to Shane. 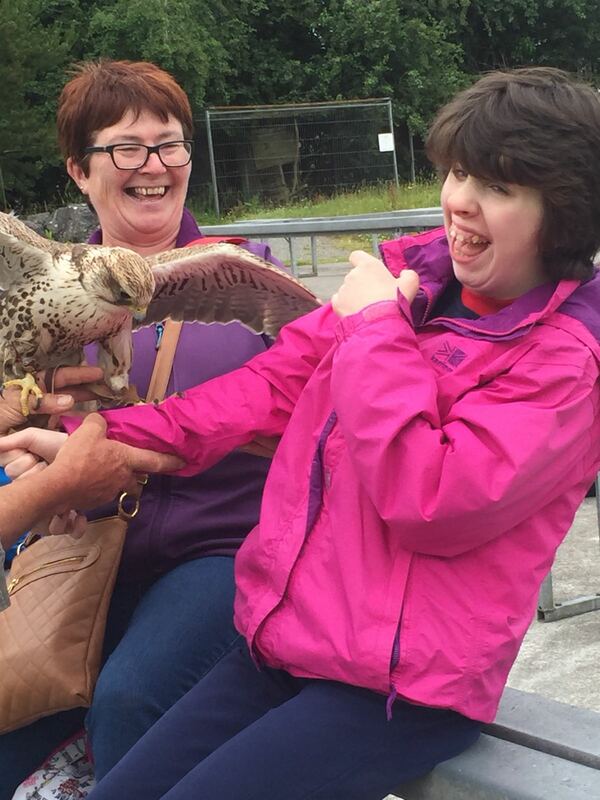 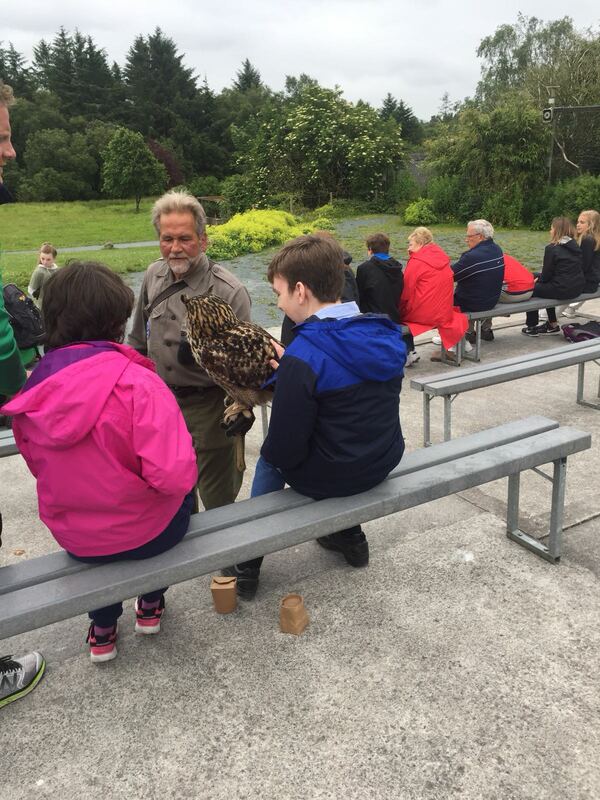 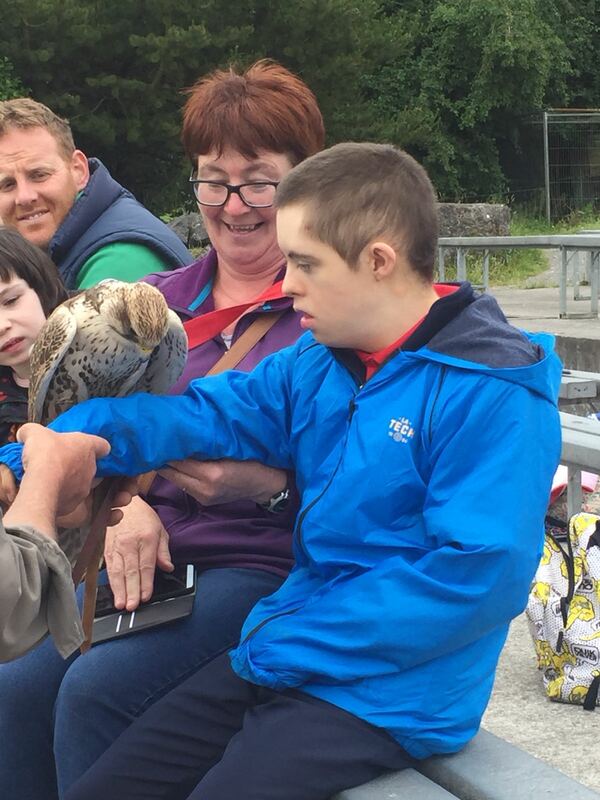 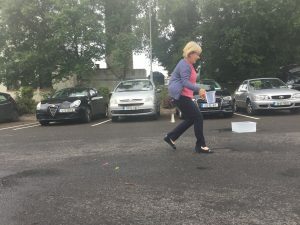 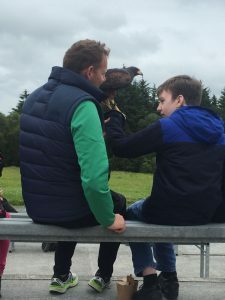 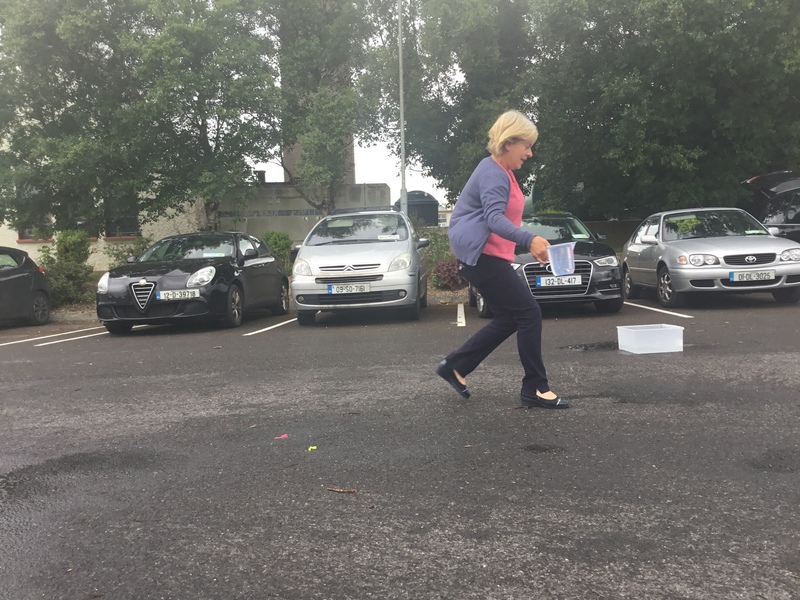 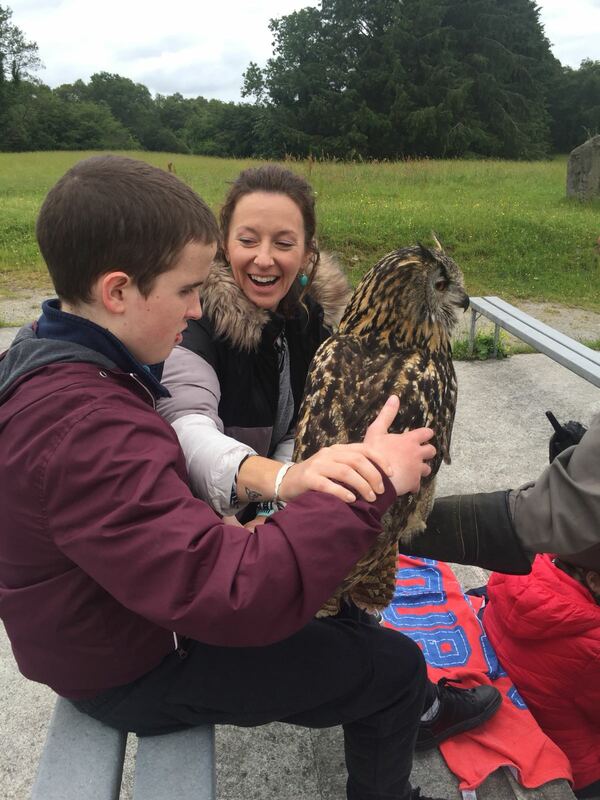 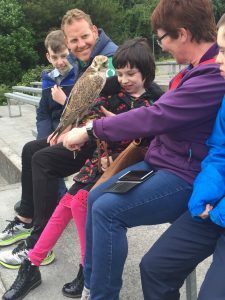 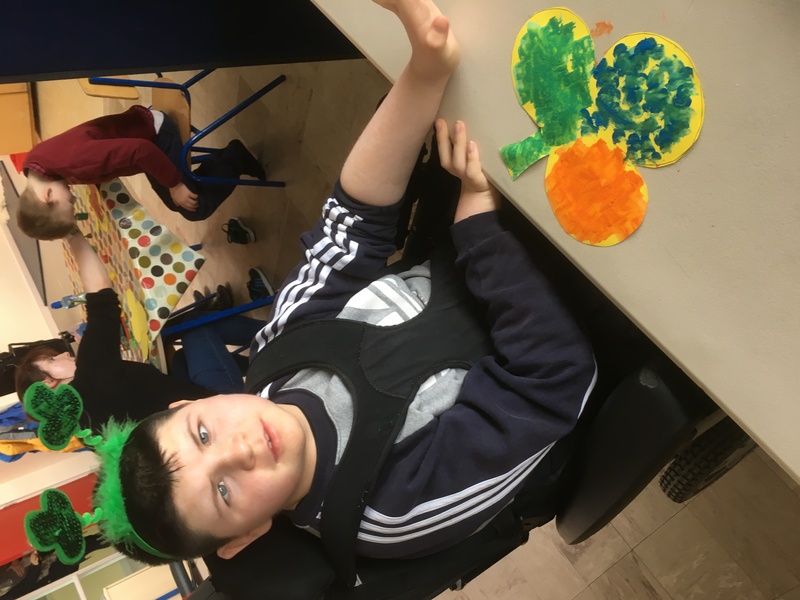 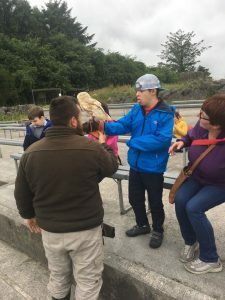 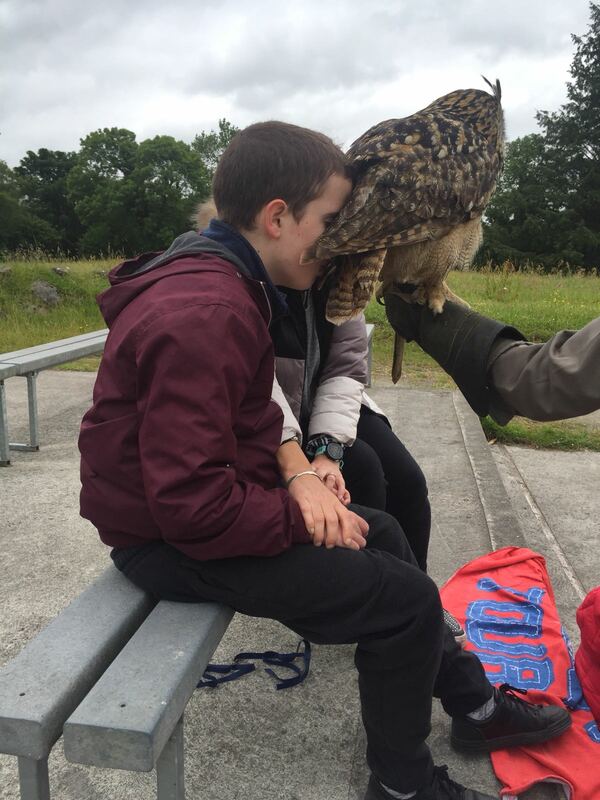 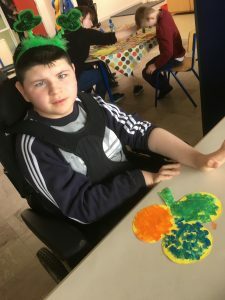 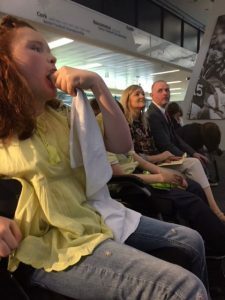 We were thrilled to get the opportunity to go to Eagles Flying in Ballymote recently (Thanks Mary & Joe, Martin and class really enjoyed his confirmation treat). It was such a fun day out. 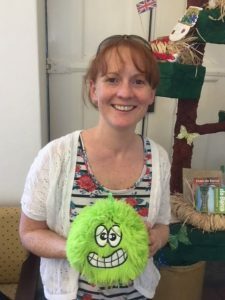 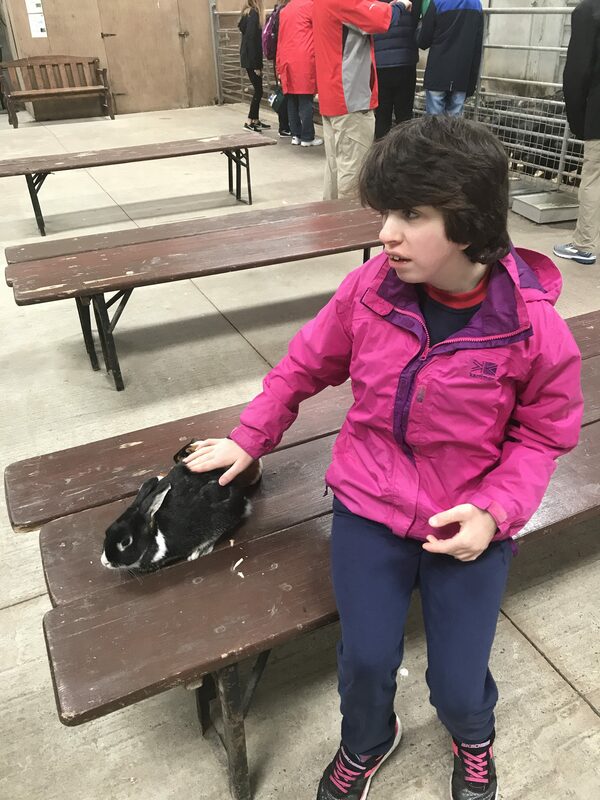 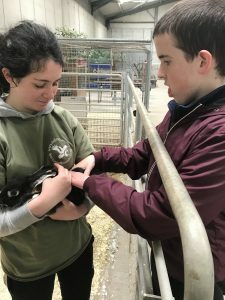 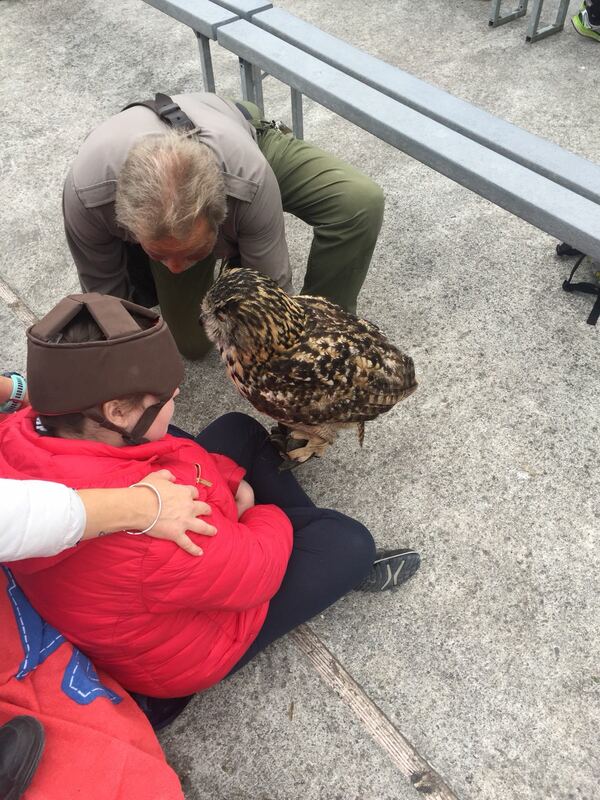 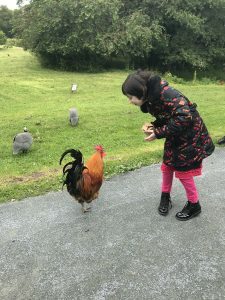 We bought food and fed the chickens and pigs, those brave enough rubbed a hedgehog, rabbit, mouse and fox and those even braver got to hold or stroke one of the amazing birds that are part of the show. We have been making the most of the sunshine in Blue class this term. 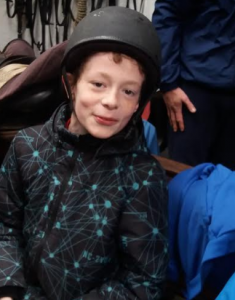 We have had 6 weeks horse riding each Friday and you can see our confidence grow week to week. 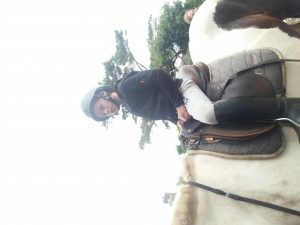 Our posture and core muscles have also developed and we are all sitting very straight on the horse. 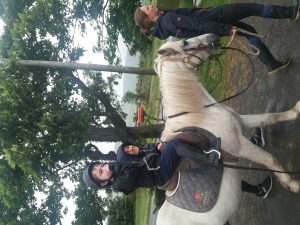 We are learning about taking care of animals and make sure we bring the horse for a drink after our sessions. We have also taken some lovely scenic walks including the Kilaspugbrone loop in Strandhill and the Devil’s Chimney in Glencar. We had a very busy active school’s week in Orange class. 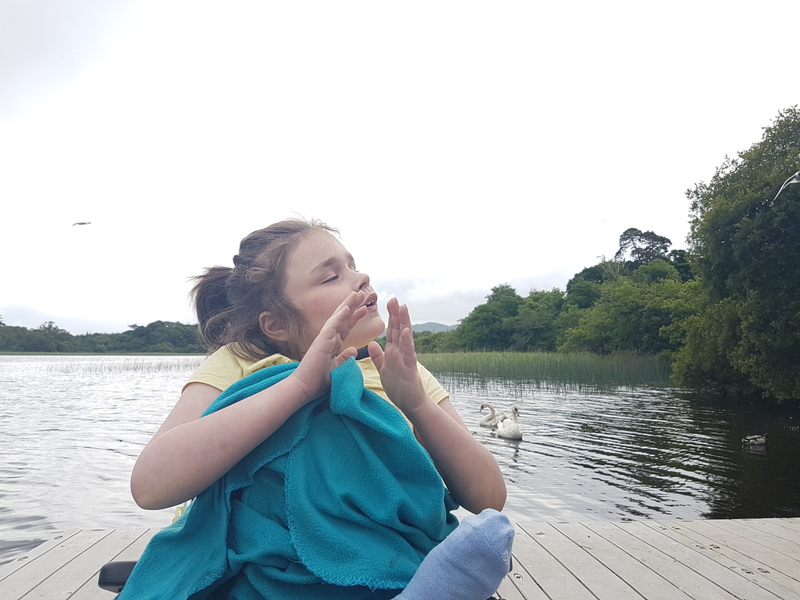 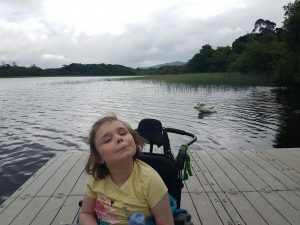 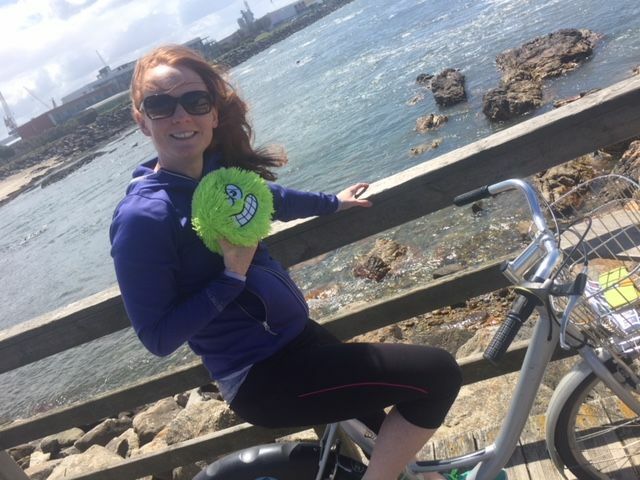 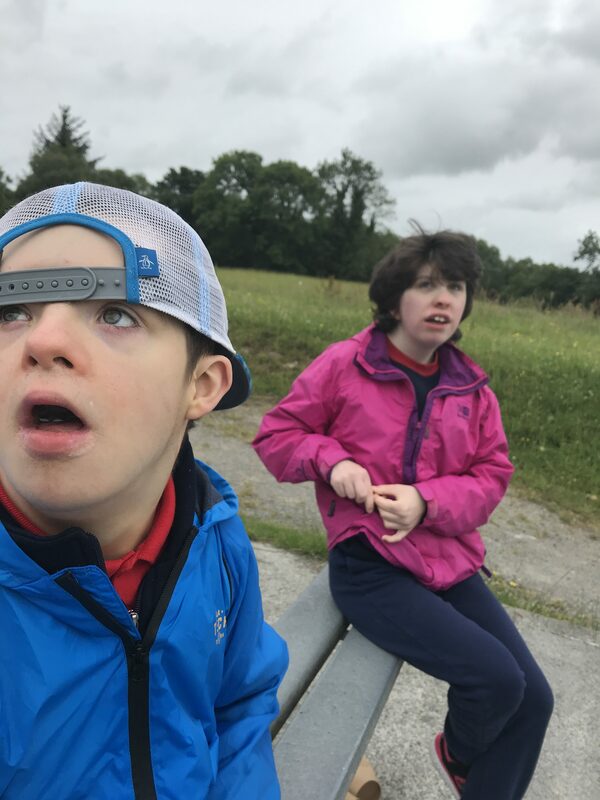 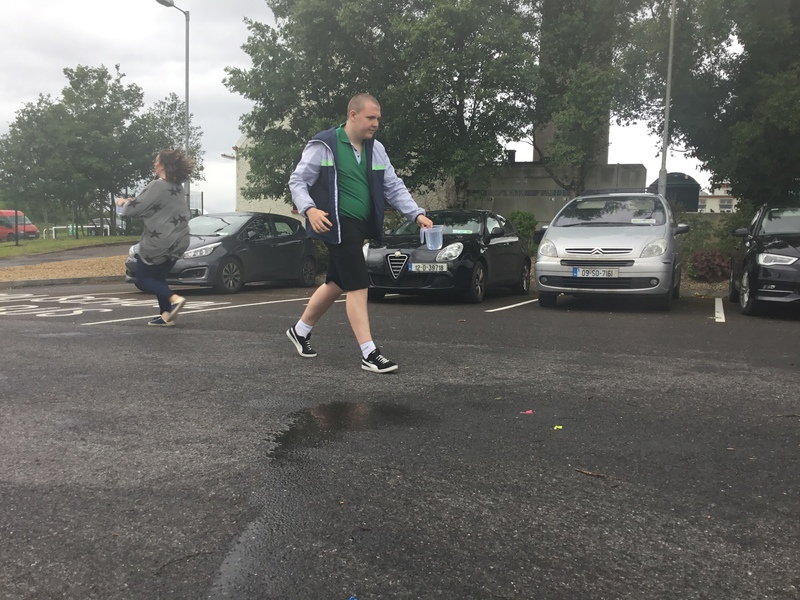 We enjoyed 10 @ 10 and we had a fantastic long walk around Doorly park where we saw a lot of ducks and swans and enjoyed being down by the water – as water is this terms theme. 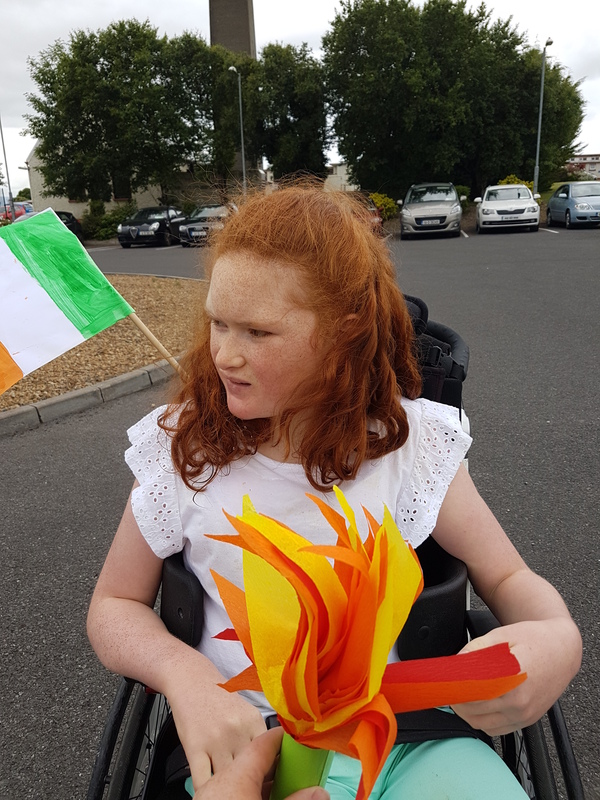 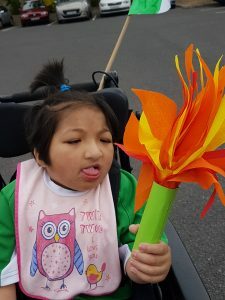 We also really enjoyed the Special Olympics torch arriving to our school. 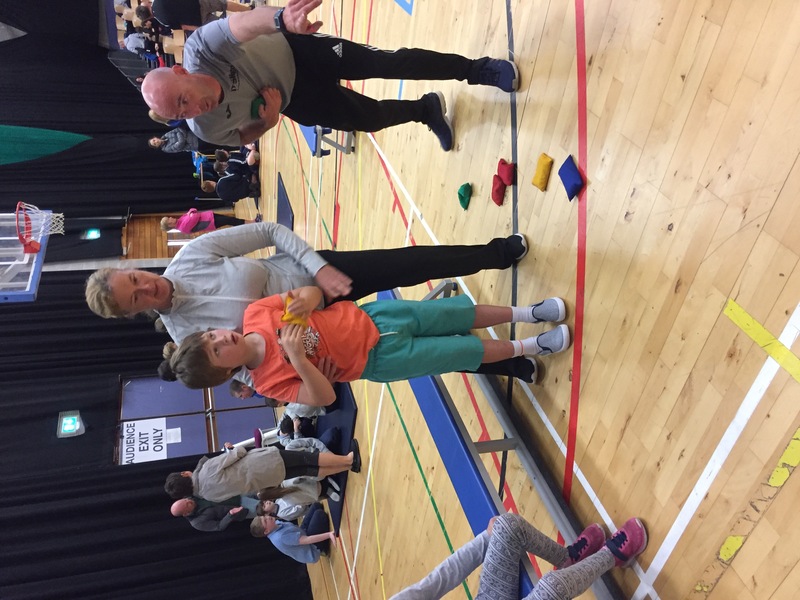 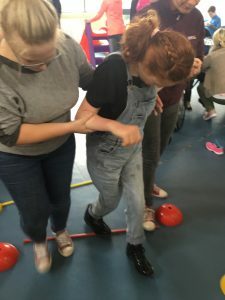 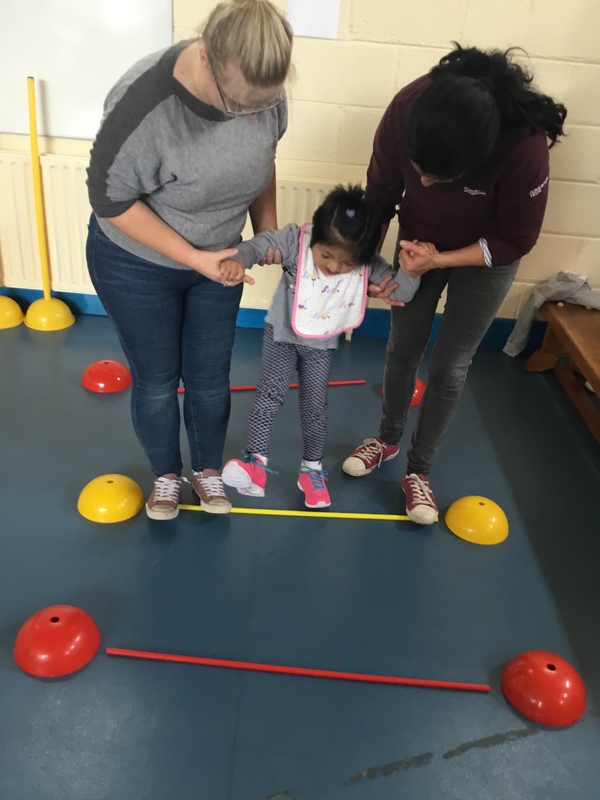 Sports day was the high light of the week where we had lots of fun giving all the different activities a go from walking, target throw, ball push, ball lift and bean bag lift. We all had a go and we even won some medals for all our hard work! 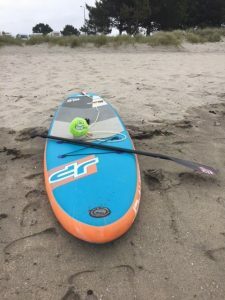 It was lots of fun!!! We have been learning all about water this term in Green Class. 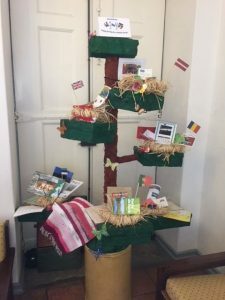 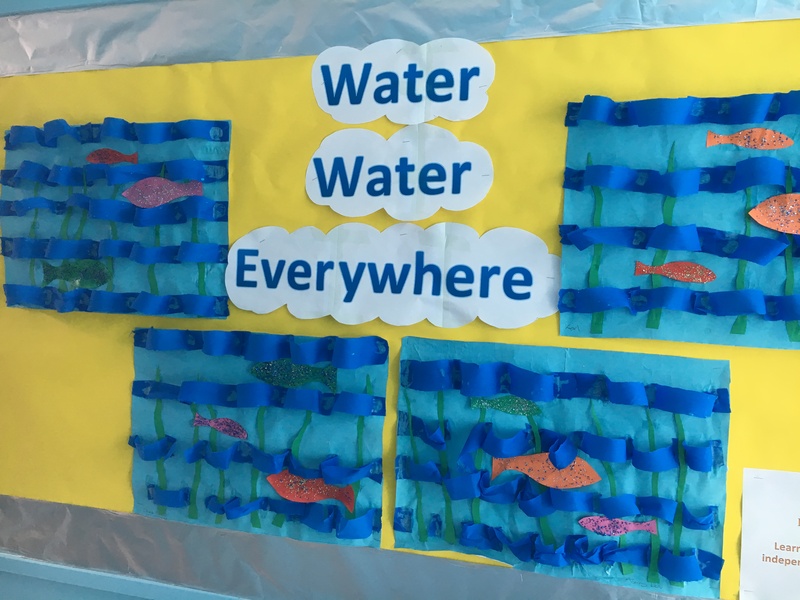 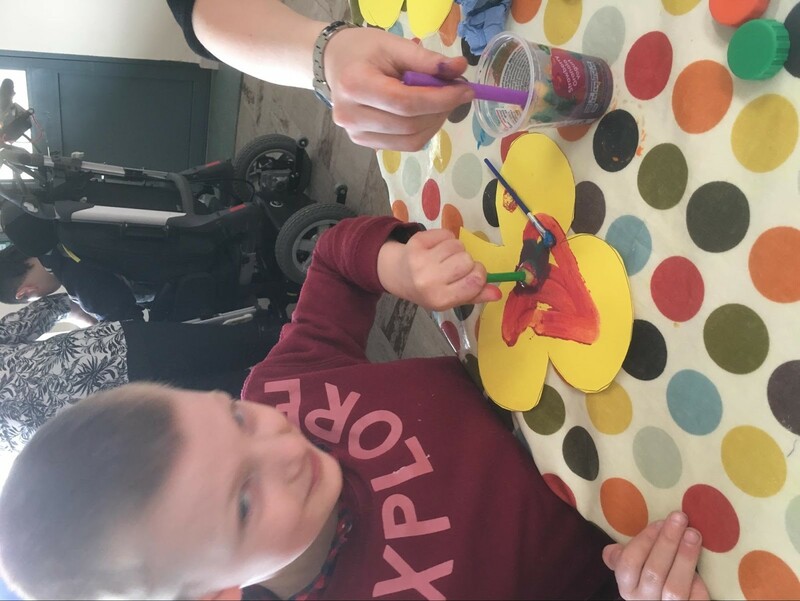 That has meant foot spas in the classroom, using water in messy play activities, water themed poems and stories and take a look at our water themed art display. 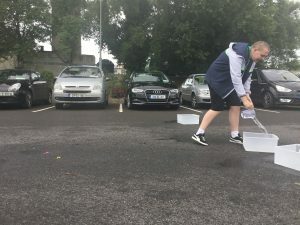 We have also been visiting places around Sligo that have water. 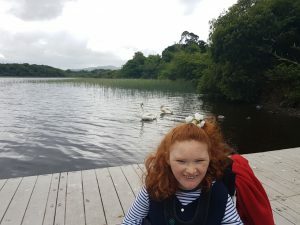 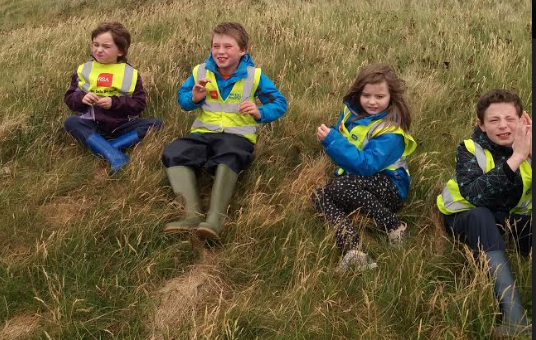 We have been to Strandhill, Glencar waterfall, and we have gone for walks by rivers in Carney and Sligo town. 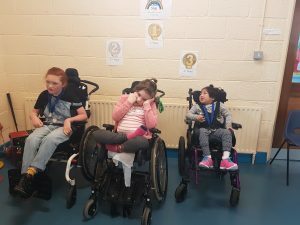 Pink Class students had a ball taking part in our school sports day last Friday the 15th June 2018. 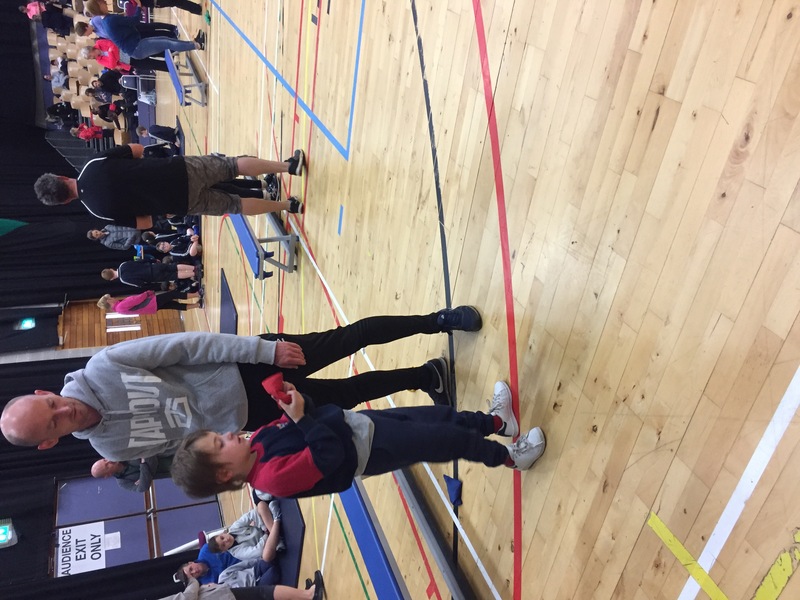 We participated in whole our school athletics events in the morning. After break we cheered on our friends in Purple and Orange class as they competed in our inter school Special Olympics Motor Activities event. And after lunch we had a fab time welcoming St. Josephs School to our senior sports day. 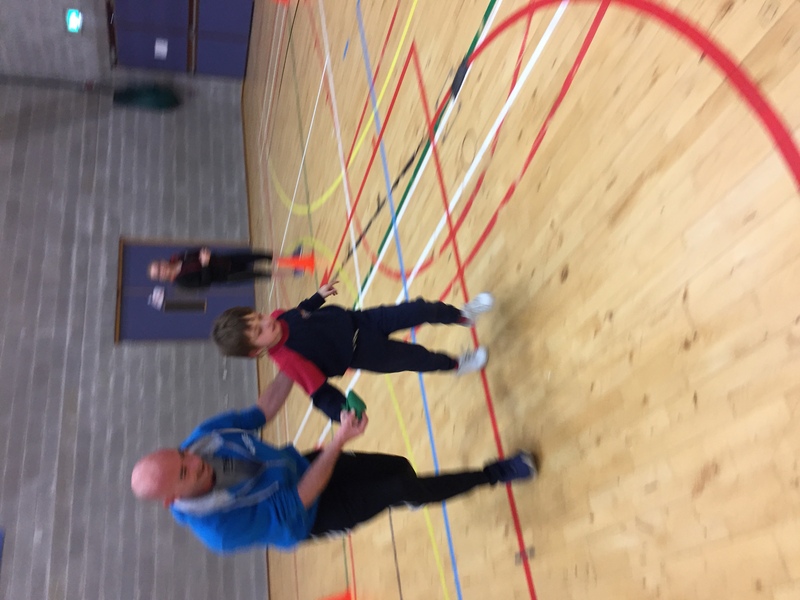 We had to move some of our relay races in to the hall as the weather just wasn’t in our favour! 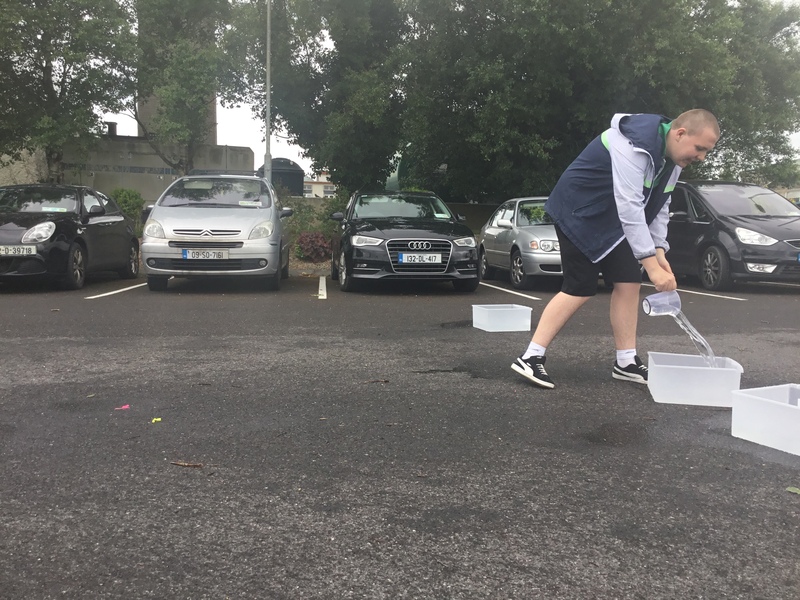 We finished the day with Water based activites in the rain! 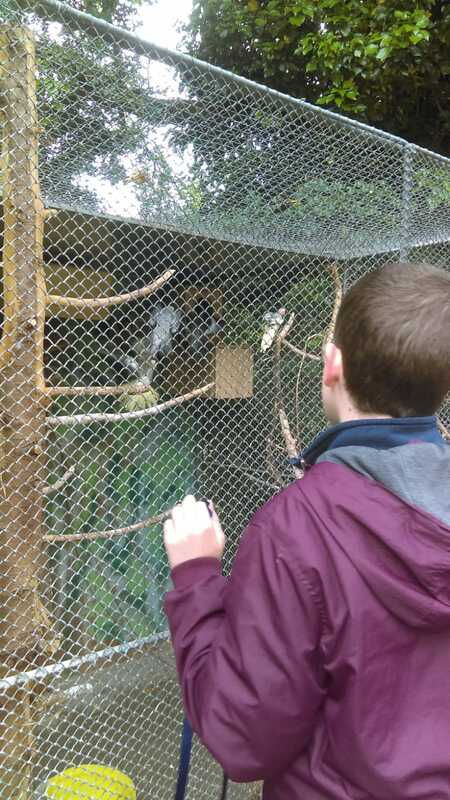 Ocerall we had a fanstatic, active day with our friends. 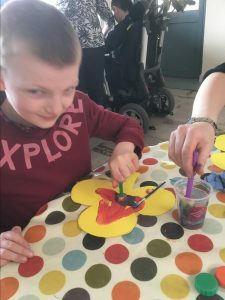 Yellow Class with green fingers! 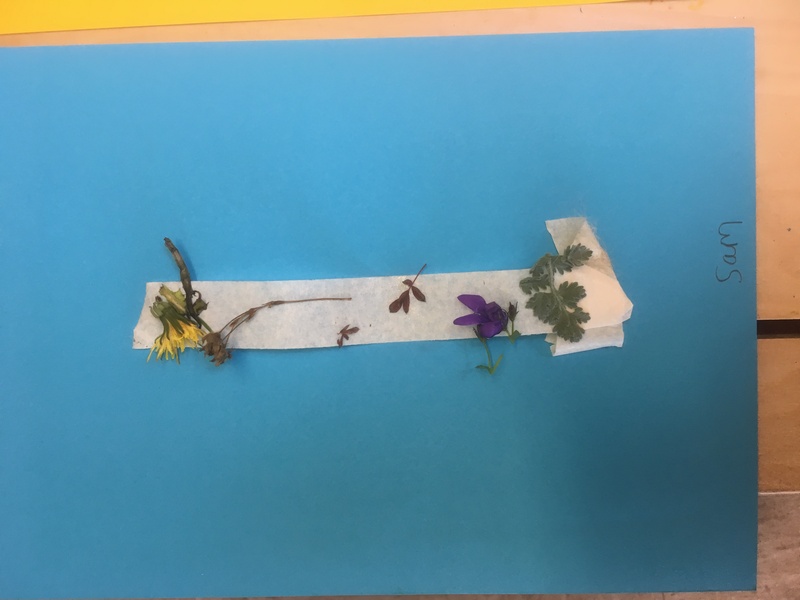 Yellow Class have been using some recyclables to develop our gardening skills. 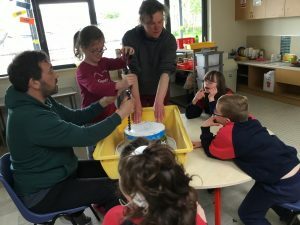 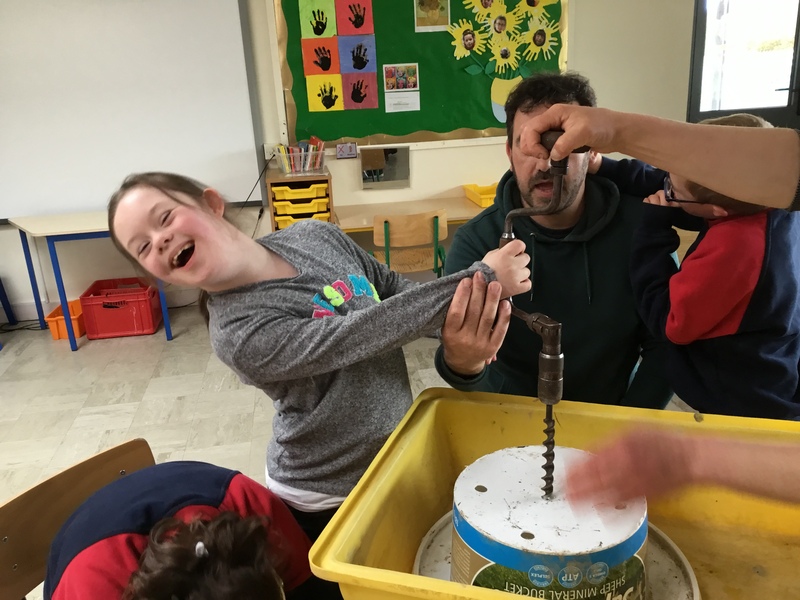 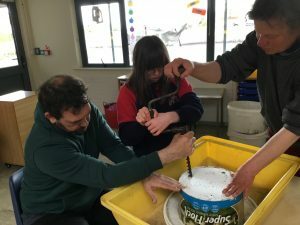 We made a huge pot by drilling holes in the bottom of a plastic bucket. We planted some tiny mint seedlings, they are not tiny anymore! We also used washed out plastic bags and felt scraps to make mini- greenhouses and put some beans in to sprout…we have had to replant, as our BEANS are now BEANSTALKS! 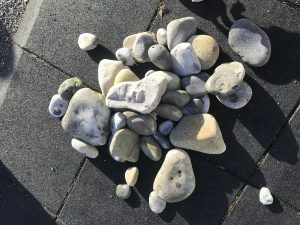 Sounds like a cue for a story? 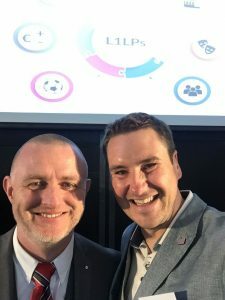 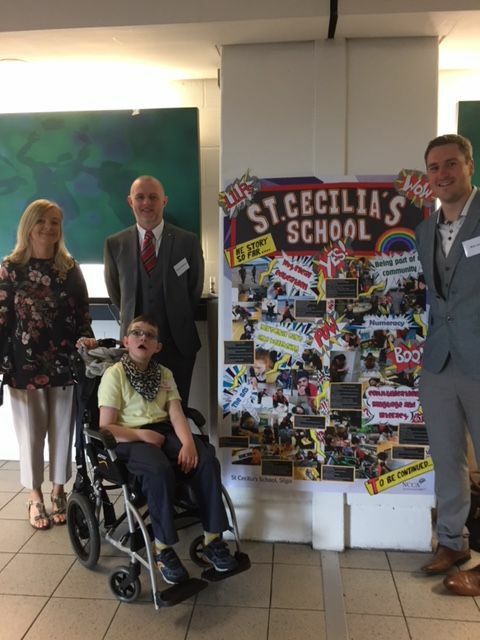 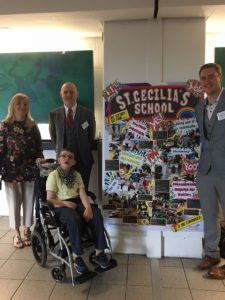 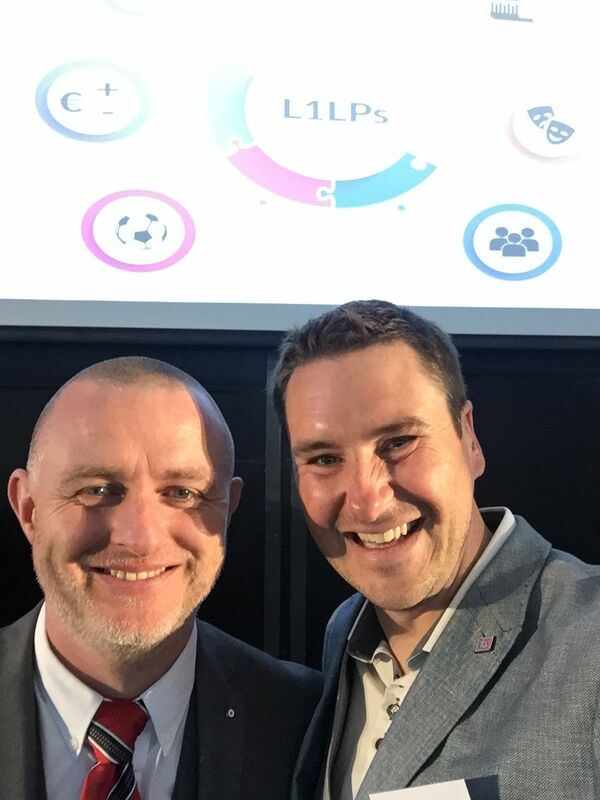 We have been privileged to have been a pilot school for the L1LP (Level 1 Learning Programmes) for the new Junior Cycle at Level 1 for this school year. Congratulations to all the students who took part and we are looking forward to continuing the work. 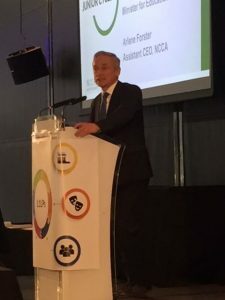 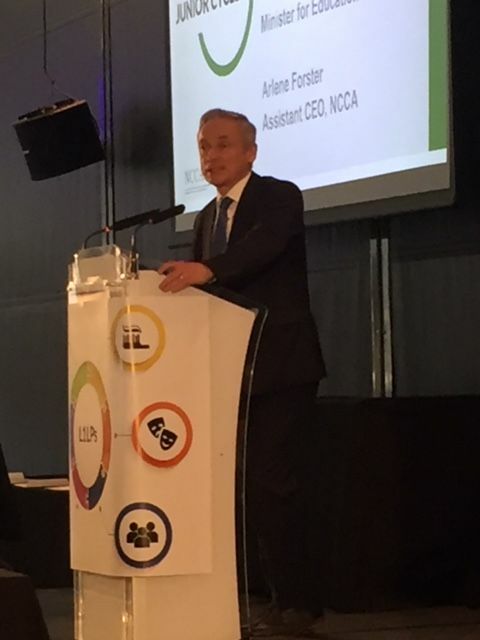 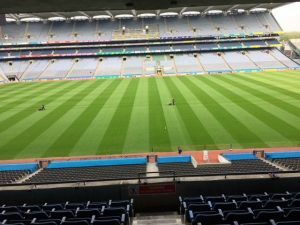 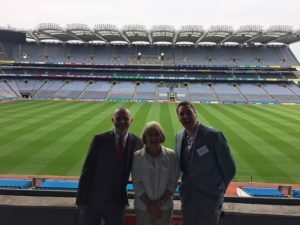 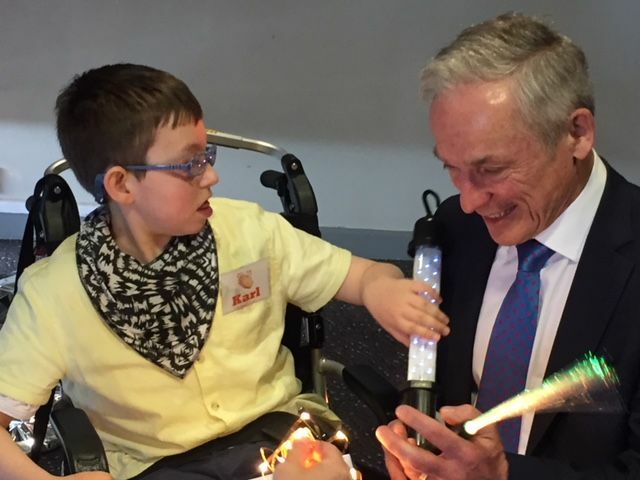 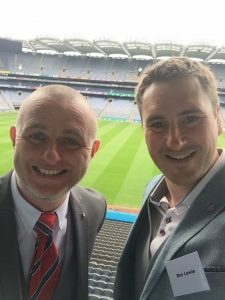 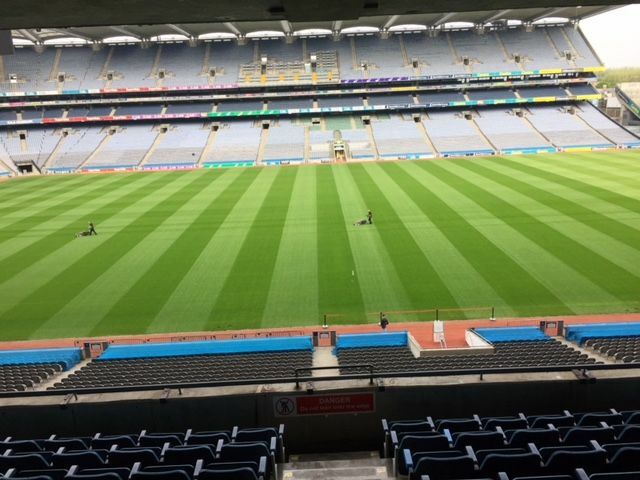 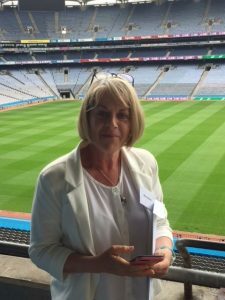 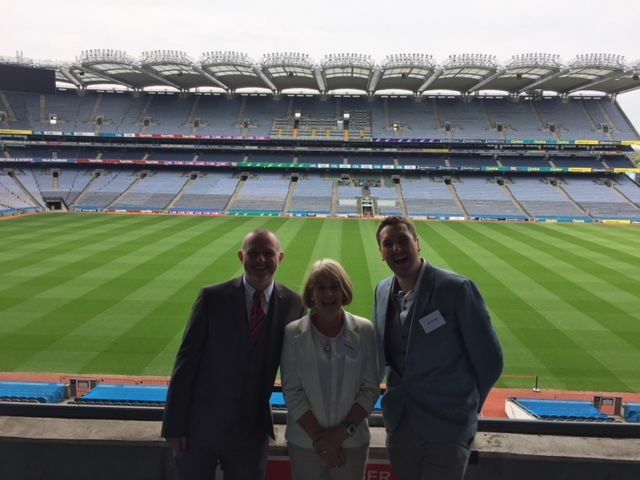 We had a lovely day for the launch in Croke Park meeting Minister Bruton. 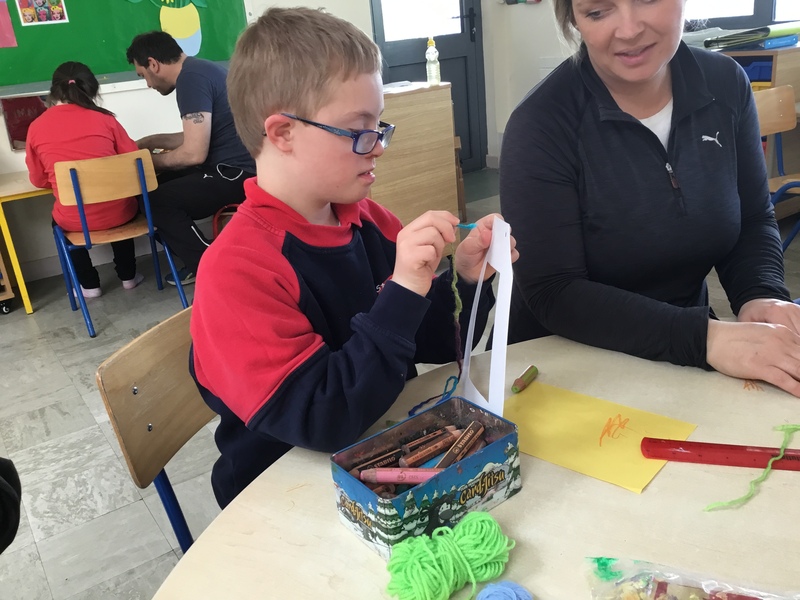 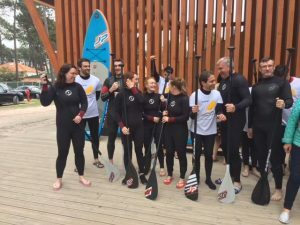 Janice and Ben recently visited our partner school in Portugal. 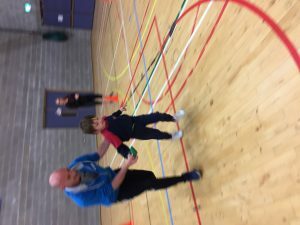 We worked on good practice for healthy living through sport. We paddle boarded, cycled, visited a playground and visited a cathedral at the top of a mountain. We learnt a lot from our Portuguese partners and are looking forward to meeting everyone again in Riga. Red class students are enjoying the last days of winter and we look forward to the spring and all that comes with it. We have been working with our visiting art therapist creating winter landscapes using a variety of materials. 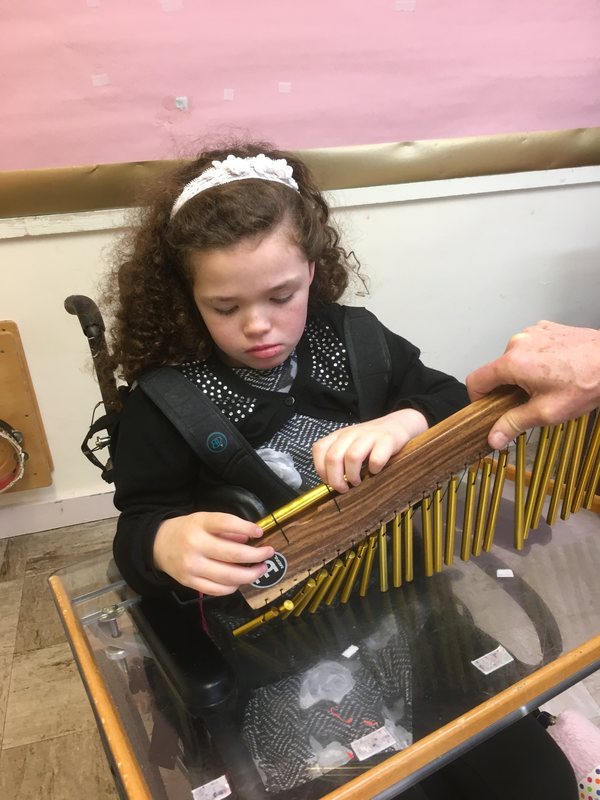 We have been preparing for Holy communion, experimenting with a variety of musical instruments and working with Sligo Sports and Recreation partnership to ensure that we keep fit and healthy. 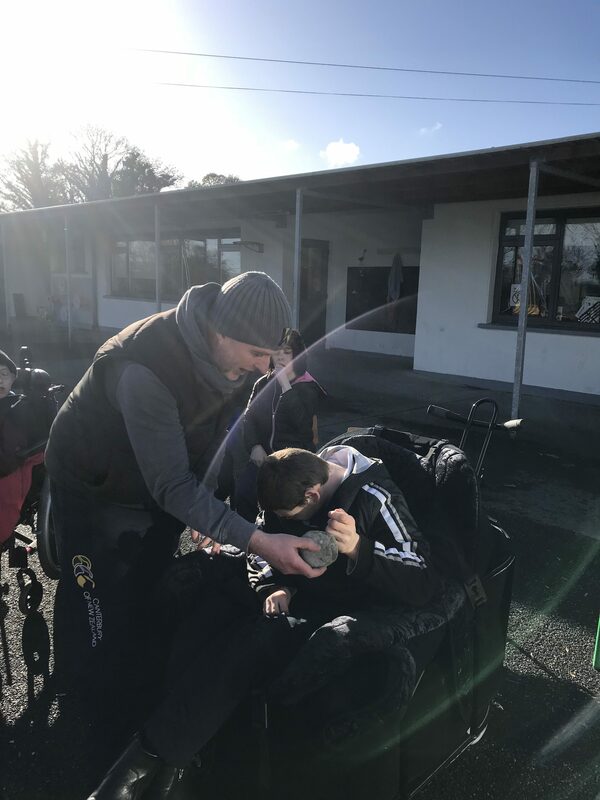 Its been a busy term!